Sony may have ticked off gamers by removing the "Other OS" option from the PS3, but it may have also inadvertently picked a fight with a significantly bigger fish: The United States Air Force. When Sony removed the option for gamers to install an "Other OS" on the PS3 in March, the hardware giant had to expect it would catch flack from gamers. And sure enough, catch flack it did: Amazon offered one gamer a partial refund after he claimed the product no longer worked as advertised, and another group of gamers have hit Sony with a class-action lawsuit. But uproar aside, those were still complaints from gamers - and as Ars Technica reports, the removal of Linux-based operating systems from the PS3 could damage research programs that use PS3 clusters in lieu of traditional super computers. Researchers at the Universities of Alabama and Massachusetts used a cluster of PS3s to solve a mystery regarding black holes in 2008, but the console is also used by a significantly more major player: The US Air Force. 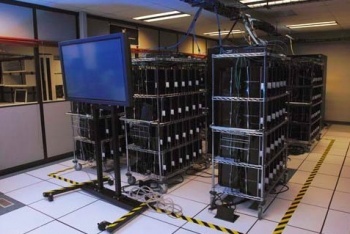 In 2009, the Air Force Research Laboratory in Rome, New York bought 336 PS3 systems to build a 53 teraFLOP processing cluster as a proof of concept. Once they'd seen for themselves how the consoles worked, the USAF scaled the project up enormously, buying 1,700 additional 160GB PS3s from a company called Fixstars for a not-insignificant $663,000. Though that sounds expensive, off-the-shelf PS3s are actually one of the most cost-effective ways to get powerful processors for research projects. And yet, only months after the Air Force spent days setting its PS3 cluster up and installing all of the necessary software, Sony up and removed the option from further consoles. While this won't have any effect on the 2,000+ current PS3s in the cluster (they're not hooked up to PSN, after all), it will make replacing them rather difficult. A spokesperson for the laboratory told Ars that the Air Force was disappointed with Sony's action. "We will have to continue to use the systems we already have in hand," said the lab representative, "... this will make it difficult to replace systems that break or fail. The refurbished PS3s also have the problem that when they come back from Sony, they have the firmware (gameOS) and it will not allow Other OS, which seems wrong. We are aware of class-action lawsuits against Sony for taking away this option on systems that used to have it." Sony might not listen to gamers, but will they listen to the USAF?